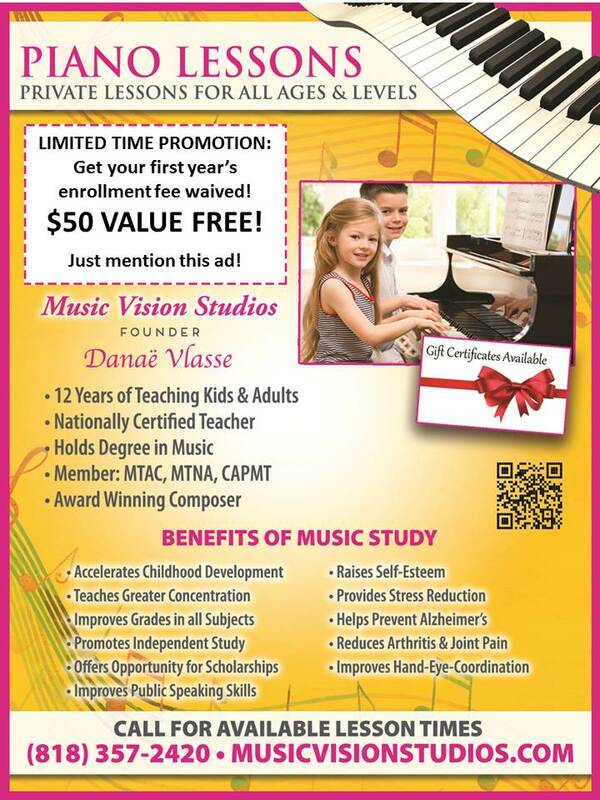 Music Vision Studios - Music Vision Studios Home Page; about our music teachers, students and composers. Click here for info on benefits of music studies! M.V.S. Currently Offers Piano and Music Composition Lessons in Winnetka, Canoga Park, West Hills, and the greater San Fernando Valley, CA. Also Offering Voice Lessons in Concord, CA. University trained & hold performance degrees. Active in teaching associations at both the national and state level. Bring music to their communities and offer frequent performance opportunities to students; community outreach concerts, fundraising recitals, masterclasses and festivals! Provide instruction on a private basis such that it may be tailored to the needs of the individual student. It enhances both physical and emotional growth - benefiting the neurological development of children and adults. Music serves to bring people together; music is a passion that unites disparate ages and varying socioeconomic groups! Finally, it serves the greater good by connecting the present to the past - allowing us to celebrate heritage and feel grounded in our culture. At M.V.S. we wish to share the joy of music-making at all levels, celebrating the excitement of overcoming one tiny weekly challenge or major achievements measured over the course of years of dedicated practicing! It is a privilege to accompany our student's lives in the musical journeys we share! Students may learn to compose their own music and have competitive opportunities to showcase their work! Many M.V.S. students perform competitively - such as the Glendale and Cypress College Piano Competitions, S.Y.M.F. and the International Chicago Competition for Outstanding Amateurs. Our students have won accolades at the local, regional and state levels. Exceptionally talented students have continued their musical careers by pursuing advanced degrees in music at the University level. Why is a child's 1st teacher the most important? The first few years of lessons ensure a foundation for proper technique, rhythm and pitch discernment. These essential elements may be impossible to correct in later years once bad habits have been established. Ensure long-term success for your child by investing in high quality instruction from the very beginning! Music Vision Studios is dedicated to promoting the works of living composers and seeks to encourage the composition of new music by classically trained composers. Original compositions may be commissioned by the public for many types of events, and anyone interested in further information may click on the tab above entitled "Commissions." Recordings of recent compositions are available on the "Buy Music" tab at the top of the site. Click on the little orange cloud icon below - you will be directed to Soundcloud.com to listen to music from Music Vision Studios Composer Danaë Vlasse!